1 April 2010, at 10:23a.m. MEXICO - Hy-line Mexico, has selected Pas Reform's modular Smart incubation technologies for the development of a brand new hatchery in Mexico. With continuing growth in the layer sector, Hy-line Mexico's success with the Hy-line W36 has prompted the development of the new hatchery at Yahualica, Jalisco Mex., which will produce 300,000 day-old pullets per week. The new hatchery, due for completion later this year, will be fitted with 18 SmartSetTM setters, each capable of holding 115,200 eggs, 18 SmartHatchTM hatchers, and complete ventilation and hatchery automation systems. 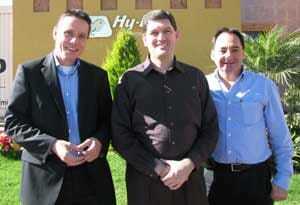 Jose Antonio Gonzalez Franco, general manager of Hy-line Mexico, said: "We have studied our options thoroughly. Ultimately, it was our participation in Pas Reform Academy's weekly courses that compelled us to invest in the new Smart systems. From these studies, we saw not only the benefits of using the very latest incubation technologies, but we also have access to the most comprehensive, up-to-date layer incubation data, through the Academy's continuous programme of research. "This quality of information combined with future-focused technologies and compelling performance are entirely in keeping with Hy-line's approach to maintaining its position at the forefront of layer breeding worldwide. "Mexico remains a buoyant and growing market and nonetheless competitive. We look forward to putting Smart Technologies to work in the new hatchery, to help us maintain that position of quality and leadership."